Each year, YWCA USA inspires community groups to organize events around the country to raise awareness about the negative impact of institutional and structural racism. Participants include local YWCAs, as well as state and local governments, schools, nonprofit organizations, various companies and small businesses, houses of worship, and more. YWCA USA wanted to provide community activists, the public, and YWCA administrators with a centralized, digital experience for everyone to register, access resources, and organize events. 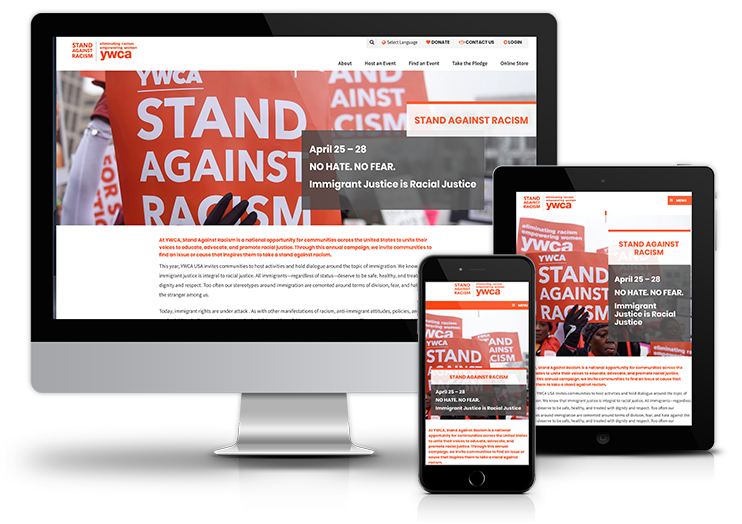 Zuri Group worked with YWCA USA to design a new WordPress site that matched the new branding and provided better tools for community activists, the public, and YWCA administrators to participate in the Stand Against Racism campaign. Using the WordPress platform, our designers and developers implemented a cohesive design that supports YWCA staff and community participants. Zuri Group is honored to be YWCA USA’s digital technology partner, helping them leverage technology to build community among those who work for racial justice and raise awareness about the negative impact of institutional and structural racism in our communities. Learn more about YWCA USA and the Stand Against Racism campaign at their website. Our team can help you design a digital experience that supports your mission.